I have baked bread every week for nearly 30 years. About the only times when I haven’t baked my weekly loaves of bread are when I have been on vacation or living in a country with great bakeries and no ovens in their rental apartments (I’m looking at you, Belgium! ), so making bread has become part of the rhythm of my life. If you’ve read my other food posts, then you won’t be surprised that I don’t use a recipe. All you need to bake bread are yeast, water, flour, and a little oil and salt. If you know how much water to start with, you’ll always have about the right amount of bread. You can even do without the yeast, which I’ve tried now and then with a sourdough. Or you can get fancy, adding ingredients like milk or eggs. The first method I used to bake bread was taught to me by my Danish friend, George, who had researched it and found what he thought of as the best. It involved making up the sponge and the dough late at night, and baking the bread in the morning. That was a great method that I used for many years. My thoughts on bread were also influenced by Ed Brown’s Tassajara Bread Book, where I learned a few of the other recipes I’ve tried, including a way to make your own sourdough starter. Eventually, as I grew older and started a family, I changed my method. The overnight one involved getting up early in the morning an hour before you wanted to bake it in order to punch down the bread and let it start rising again. We decided fresh bread for breakfast wasn’t essential, but more uninterrupted sleep was, so I developed a method to make bread in the morning and have it ready for Sunday lunch. It takes about 4-5 hours from the time you add yeast to the water to the time it comes out of the oven. Over the years, I’ve discovered that bread is very flexible and very forgiving. Though I follow the same method every week, it rarely comes out identical. A lot depends on the kinds of flour you use, though I keep that fairly consistent. Sometimes I’ll ad buckwheat or rye, and we like to include some oatmeal when we have it on hand. Otherwise, I usually use about half white and half whole wheat. How the bread rises depends on the environment and how attentive I’m being. In the winter, I might warm the oven before putting in the dough. 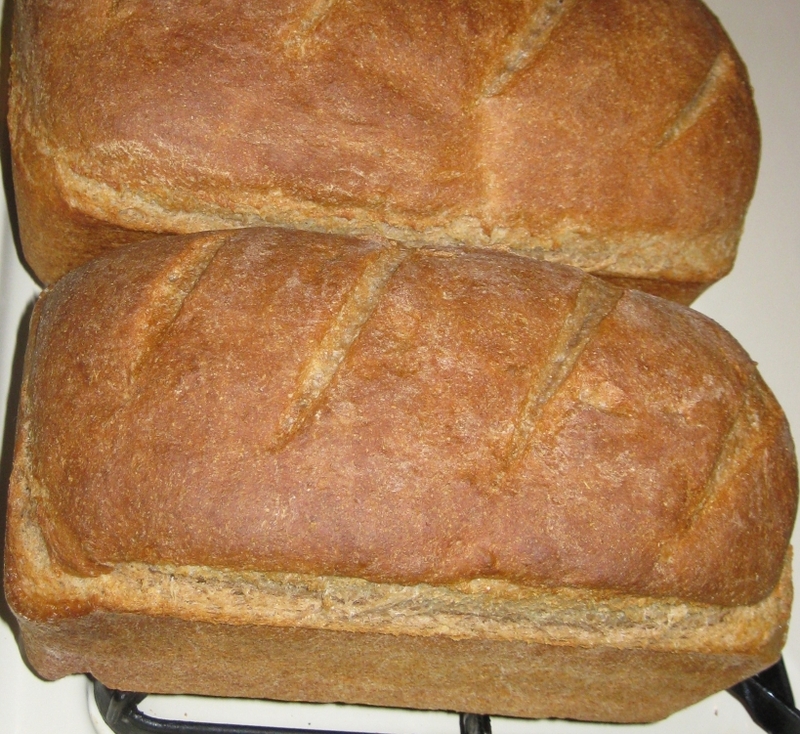 See my post on Twice Baked Bread for a time when this went really wrong, but the bread still survived! I’ve had plenty of mishaps and baked a few barely edible bricks, but by and large, the bread turns out wonderful every week, especially when it’s fresh from the oven. What this has taught me in terms of a philosophy is to be flexible myself. Though I aim for perfection, I try not to define it too much in advance, and I try to be open to valuable surprises. If things don’t go the way I expect them to, I try to roll with the punches and find a new way. So if I’m baking bread and I’ve forgotten to punch it down when I should, I either extend the time I need before the bread comes out of the oven, or I skip the second rise and put it into loaves right away. Generally, that works relatively well, given that I often leave it in the sponge stage long enough to develop some really good gluten (no I haven’t jumped on the anti-gluten bandwagon—I’ve never had a problem with it, at least not with homemade bread). Other times, if I’m in a bit of a hurry, I might skip the sponge stage and make sure i give it two really good rises before making it into loaves. It might take a little longer rising in the loaf pans if I do. I like the rhythm of making bread, mixing it up, kneading the dough, watching it rise, nursing it along or letting it do its own thing as needed or as my schedule will allow. And of course, I love the taste of fresh bread! I rarely buy bread in the store and am disappointed when I do. I don’t mind bread-machine bread, but making it on my own is easy and such a part of normal life by now, that I hardly see the point in a machine. I could use our KitchenAid to do the mixing and initial kneeding, but so far I prefer to do it by hand. It’s what keeps you grounded to the food you eat, and that is what can turn any kind of cooking into a philosophy best written in the daily or weekly habits and the food you make. I really enjoyed reading your post here. You have a great writing style! I hope you’ll come check out my new post and leave me a comment with your thoughts.